CART is committed to providing public transportation to everyone. 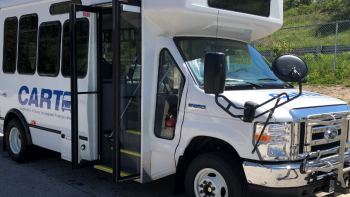 All of our buses are fully accessible and ADA-compliant. All CART operators receive extensive training in the proper operation of CART vehicles and accessibility features. They will make every effort to accommodate the disabilities of CART riders, so they can safely access CART services. 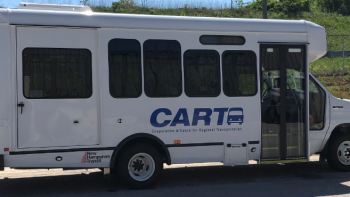 • All CART buses are equipped with lifts or ramps for boarding ease. • Buses “kneel” to make boarding more convenient. • Each bus can carry a minimum of two personal mobility devices. • Plan to arrive at the bus stop at least five minutes early. Be sure you are inside the bus shelter or near the bus stop so the driver can see you. If you require the use of the lift or ramp, please stay about eight feet away from the bus so that the lift or ramp can be lowered safely. • If you need the kneeler, please let your coach operator know. • To avoid turning around in the securement bay, you may find it easier to board by backing your device onto the lift. • Please turn off mechanized devices and lock the wheels while on the bus lift and again once you are safely secured. • If visually impaired, upon boarding we encourage you to inform the coach operator which bus stop you need. • To alert the coach operator that you want to exit the bus, approximately one block before you’d like to get off, press the tape or pull the cord located near you along the windows. 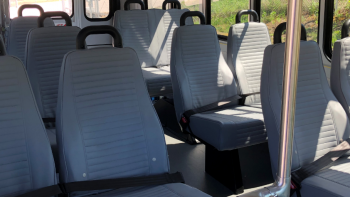 • When the bus comes to a stop, you may want to allow other passengers to exit first so the aisle will be free for you to maneuver. • The coach operator will release the securement straps and guide you to the door.